John V. Snow (Waazhashk is from the (Chippewa) Ojibwa Tribe in Lac du Flambeau, Wisconsin area. John has been carving for over 60 years and his carvings are highly sought after. John V. Snow “Waazhashk”, age 77 of Lac du Flambeau, died on Friday, January 22, 2010 at his home. He was born on September 5, 1932 in Lac du Flambeau. John is survived by his children, Sharon A Mehling; Ronda J. Snow; John T. Cross; Daryl “Pete” Cross; Vincent Snow; Jackie Snow and Gary Snow; grandchildren, Sonya Snow Psuik and Brom Costa; Justin and Lance Mehling; Andrew, Scott and Sarah Snow; Nicolas, Matthew and Mark Armeth; April Cross; great-grandchildren, Alexis, Seth and Josephine Mehling; Jamie and Anthony Cross. He was preceded in death by father, Thomas Snow; mother, Louise Wildcat; sisters, Blanche Peterson, Lillie Wayman, Louise Jack, Elizabeth Doud I; long time companion, Luanne Beam. 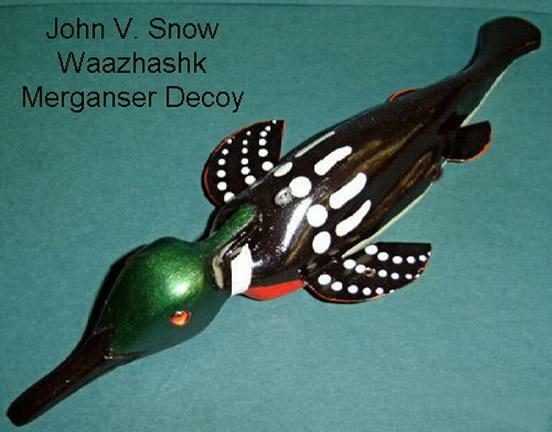 Example is a 8 1/2″ Merganser Fish Decoy.